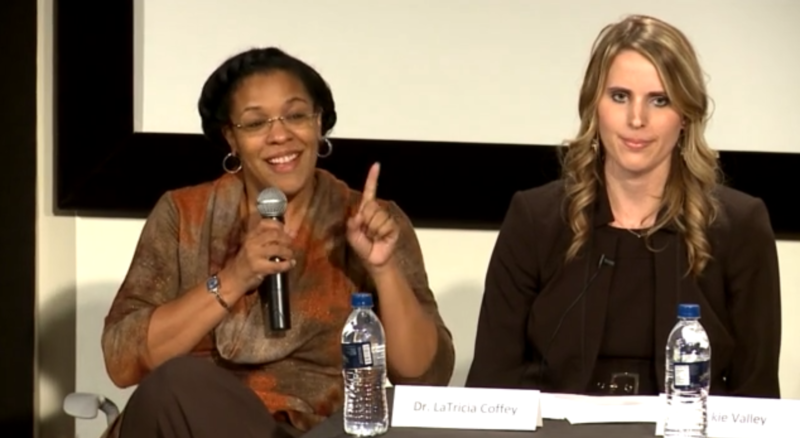 Jackie Valley of The Las Vegas Sun, at right, with Dr. LaTricia Coffey at a community forum to discuss Nevada’s mental health crisis among children. In early September, I sat in a woman’s kitchen for nearly two hours as she described raising her 14-year-old son, Gabe. She talked about his penchant for video games, cooking and sci-fi books, his kindness toward his younger brothers and his lifelong battle with mental illness. It hadn’t been an easy road. About a month earlier, Gabe had been released from a residential treatment center in Texas. Ten days after his release he wound up at University Medical Center in Las Vegas following a manic episode. That’s where I first met Gabe and his mother, Jaleadeanne Robison. I was shadowing an emergency room doctor that night as part of my reporting about children’s mental health in the Las Vegas Valley. Robison graciously let me in their hospital room and even gave me her phone number. I’m not the most aggressive reporter. I entered the hospital room feeling guilty — as if I was intruding on a private moment. Their openness floored me, but it also triggered a realization: Families caring for children with mental health problems are so overwhelmed and looking for answers that many yearn to talk. They want to be heard. The realization proved pivotal down the road as I mulled over how best to engage the community for my reporting project, “Children in Crisis.” Community was the key word from day one. When I embarked on the project, I set out to examine the community toll of what doctors called an epidemic — the large volume of children and teens with mental health issues. How were schools, hospitals, the juvenile justice system, and, of course, families impacted? And, more importantly, what was being done to help these young community members suffering from anxiety, depression and post-traumatic stress disorder, among other conditions? To understand the scope of the problem, here’s a primer: State data shows that, other than a small dip in 2012, the number of children entering Clark County emergency rooms for mental health-related reasons has steadily increased over the years — from 5,071 patients in 2009 to 6,619 in 2013. Nevada officials estimate that one in five elementary-age children grapple with behavioral health problems, and a quarter of the state’s middle school students have seriously considered suicide. But many aren’t getting the help they need. There are too few pediatric psychiatrists, psychologists and other mental health workers in Southern Nevada, leading to long wait lists. Many children who need residential treatment must go out of state because of limited in-state options. Lousy insurance coverage hampers others’ efforts to receive help. And when children do receive care, it’s often uncoordinated given the fragmented nature of the system — doctors, therapists, social workers and educators often don’t communicate well. Fortunately, the state received an $11 million federal grant to revamp its children’s mental health system. Spread over four years, the grant is certainly not enough to fix everything, but it’s a start. And I knew it was my avenue to involve the community. With the state trying to fix its system, now is the perfect time for parents — or anyone else who interacts daily with these children — to speak up and offer suggestions. So we decided to host a community forum. If you’re wondering how to even begin doing such a thing, don’t worry. You’re not alone. Prior to working on this Center for Health Reporting National Fellowship project, “community engagement” had not been part of my vernacular. I was just happy if my stories received some social media traction. I now have a whole new perspective. Community engagement and journalism go hand in hand. Why sink tons of time and effort into a topic only to let it fade away after the stories have been published? It doesn’t make sense. Journalism, at its core, is about imparting information to create change. That could be as simple as making someone smile with a fun, human-interest story, or as ambitious as spurring changes in laws for the greater good. In this case, I wanted “Children in Crisis” to educate readers about the problem but also to prompt a conversation about how we, as a community, could better serve children with mental health problems and their families. It’s a community problem; it’s not solvable by any one organization or group of people. 1. Don’t expect to do this by yourself. It’s a big undertaking, involving tons of planning. Find community partners who have organized similar events in the past and are somehow connected to the issue. The Las Vegas Sun partnered with Nevada PEP, a parent advocacy organization, the Clark County Children’s Mental Health Consortium, and the Lincy Institute at the University of Nevada, Las Vegas, which does research about children’s mental health. The Lincy Institute folks helped me plan the forum, taking into account everything from catering to lighting and sound. Some of the details they mentioned never would have occurred to me otherwise. More importantly, the three co-sponsors felt like they had a stake in the forum and, thus greatly helped spread the word about it. Keep in mind: A community forum only works if people show up. 2. Take a boots-on-the-ground approach to advertising it. Yes, tease the event in the newspaper and online, publicize it on social media and blast it via email listservs. But don’t stop there. I also created fliers and spent one afternoon driving all around Las Vegas, stopping at community centers, schools, treatment centers, and so on to drop them off. Don’t assume everyone is reading your website or newspaper. A simple flier posted on a bulletin board where families congregate might be the first time someone hears about the event. 3. Plan an icebreaker to get the forum started. 4. Find a way to engage the attendees. My community engagement mentor suggested we bring oversized note pads and easels to the forum. That way, we could actively jot down notes as people offered their challenges and suggestions. It’s a great way to make the attendees feel like they’re not just speaking into thin air. I also used the forum discussion to craft my final story, which was focused on solutions. If your community forum goes well, you’ll have a great network of many new sources but no time to talk to them all. Ask attendees to sign in and, if they’re willing, provide their phone number and email address. This will become your handy guide for future stories. I was very nervous heading into the community forum, but after a few minutes, the nerves faded and it was fun. Be confident. If you’ve poured your heart into reporting, you’ll know the topic well and be comfortable discussing it. I’m happy to report that our community forum went beyond my wildest expectations. About 200 people showed up, filling the university auditorium. The conversations were lively, poignant and even amusing at times. The auditorium possessed an undeniable energy, as attendees savored the opportunity to share their experiences and suggestions. Seated among the attendees: Jaleadeanne Robison whose son, Gabe, had ended up back in a psychiatric hospital weeks earlier. Being able to give parents like Robison a voice made the experience worth it.